Join us at Book Culture on Columbus on Thursday, April 11th at 7pm for a poetry reading and discussion with Gretchen Primack as she discusses her latest work, Visiting Days. 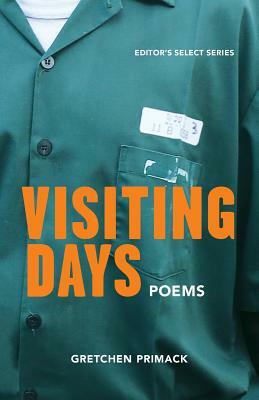 Visiting Days is a collection of persona poems "set" in a maximum-security men’s state prison like the ones in which the author has been teaching for many years. Incarcerated men and others speak from various places in the facility—the laundry room, the hallway, the school building, the visiting room, solitary confinement, and more. Perfect for those concerned with issues around mass incarceration and social justice, along with contemporary poetry lovers. Says Truth Thomas, "In writing about the mass incarcerated skeleton in America’s closet, Primack unapologetically affirms the fact of their existence and their humanity. This courageous work is authentic in the feel of its persona poems, masterful in its balance of poetic impressionism and realism." Gretchen Primack is a poet and educator living in New York's Hudson Valley. She has taught and/or administrated with prison education programs (mostly college) for ten years. She's the author of three poetry collections, Visiting Days (forthcoming from Willow Books), Kind (Post Traumatic Press), and Doris' Red Spaces (Mayapple Press), and a chapbook, The Slow Creaking of Planets (Finishing Line 2007). She co-wrote The Lucky Ones: My Passionate Fight for Farm Animals with Woodstock Farm Animal Sanctuary co-founder Jenny Brown (Penguin Avery 2012). Her poetry publication credits include The Paris Review, Prairie Schooner, Ploughshares, FIELD, Poet Lore, The Massachusetts Review, The Antioch Review, New Orleans Review, Rhino, Tampa Review, and many others, and her work has been chosen for several anthologies, including Best New Poets 2006. Her poem "You Are a Prince," published in Ploughshares, was featured on PoetryDaily.org.